Today was a great day. I decided to attend an event in my area called San Diego Festival of Books, where I walked around and did some networking for the blog. I met fantastic, creative people and I’m so excited to collaborate with them. Putting yourself out there is not only draining – it can be a challenging task. 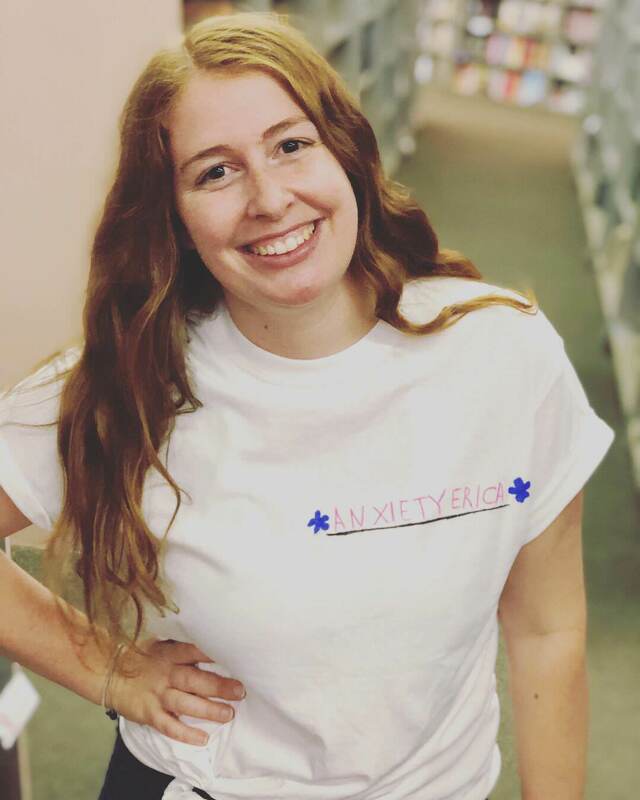 While everyone was thrilled to hear about Anxiety Erica, my anxiety can find it easy to get worked up about whether everyone truly is interested in what I have to say. Paired with the fact that one or two posts I did on my Instagram didn’t go over as well as ones previously in the week, my anxiety was looming over the fact that I wasn’t good enough. That not enough “likes” equates to the caliber of my writing, my healing process. That’s not reality. I fought it in my ANT journal, because this blog is way too important to me to let a silly, trivial thing like social media likes bring it down. But, I was still a little drained. Then my Keep It Grape Self Care Pack arrived in the mail. Game changer. Almost like mental health mail from the gods above, this package came right at the moment I needed it most. It made me realize I am making a difference – I’m connecting with creative, sensitive, and strong women like Katherine. Located over at @keepitgrape, Katherine is one of the purest souls I’ve ever encountered. Just 17 years old, Katherine is a freelance artist with her own online store filled with positivity prints, self care packs, custom commissions, zines, stickers, and poetry. Pouring her heart and soul into each piece she creates, she does it all while battling paranoid schizophrenia. In addition to her art, she has a blog where she interviews other bloggers on the importance of mental health, recipes and positivity. You can check out her interview with me here! Intended to promote relaxation and self care, these powerful packs get you to understand the importance of caring and maintaining your body. Focused on the essential mantra that we all deserve self care, Katherine showers each and every customer with love, positivity, and encouragement. Self care is important, but what if you don’t know what that means? While it’s different for each individual person, Keep It Grape has some great starter tips to delve deeper into what works for you! This was a wonderful reminder for me, honestly. While I can be really good at self care involving reading, bath time, and relaxation – I’m lacking in the food department. I can be pretty lazy when it comes to cooking or prepping of any kind, so these recipes were a welcome sight. I plan to try this one out! Positivity can be hard to find sometimes. Not only great reminders to love ourselves, these prints are just gorgeous. Promoting and symbolizing self care and relaxation, I will be hanging them on my cork board next to my bed – that way I see the important words when I wake up and fall asleep at night. I won’t lie, these were my all-time favorite. I adored everything in this package but these small, simple drawings were perfect. Encouraging self love and growth, they are beautiful and tiny enough to keep in your car, purse, tote bag, or on your bookshelf. Anywhere you are, there is a constant reminder of love, hope, and positivity! As if all of the goodies in the package weren’t enough, Katherine sneaks a lovely, personal note and sticker into my Self Care Pack. Reading through it filled me with inspiration, hope, and honestly eased my anxiety from the day. Job well done. With a combination of creativity and heart, Katherine makes it her full time job to bring others happiness with Keep It Grape. From opening up her package today, it was clear just how much she lives and breathes this work. She gives each person a piece of her heart. I’m proud to know such a talented, motivated and beautiful young woman – she is truly the future of mental health. To learn more about Keep It Grape and Katherine’s art, visit http://keepitgrape.tictail.com/. Head to her blog and Instagram to see her latest pieces!